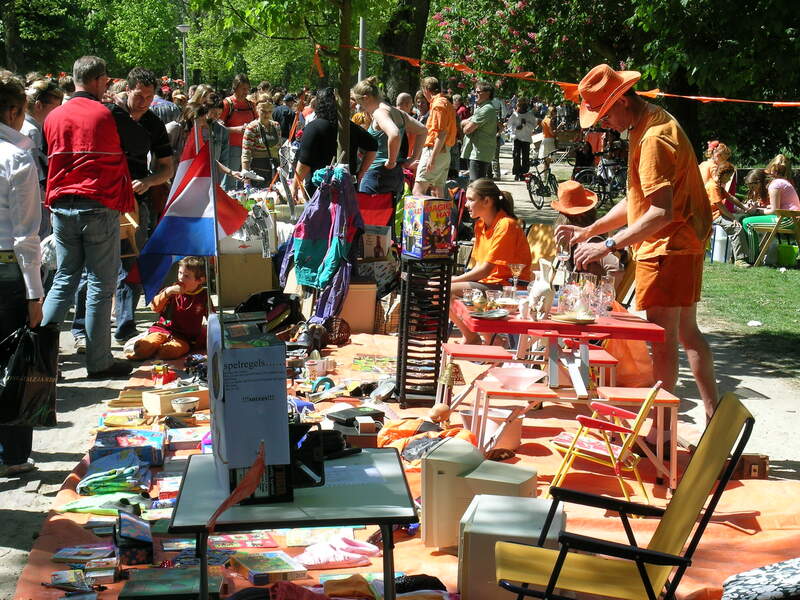 One in three adults buy something orange for King’s Day – are you one of them? If you are in the Netherlands at the moment, you cannot fail to have noticed it. Yes, King’s Day is about to hit and the orange tat is everywhere. This year, according to ING, three in 10 adults will buy something orange to wear – with the average bill reaching €26! This year too, the Friday weather forecast is not as bad as it could be. The day will start out sunny but there will be showers, particularly inland, although the temperature could be as high as 17 degrees in the south, the KNMI says optimistically. Here at DutchNews.nl opinion about King’s Day is divided. Some of us have been collecting our clutter to sell for months, some of us have a 24-hour feest ahead of us and some of us are even leaving the country to get away from it all. All you need is a plan. Here’s an updated version of ours. 1. If you are a party animal, you need to know that the best parties all take place the night before King’s Day and run until breakfast. This means you will not be up and about before mid-afternoon and will miss almost the whole thing. 2. If you are a bargain hunter, you need to get up early. If you are a real bargain hunter, you need to get out of the big cities and head for a small town where they won’t expect you to pay €15 for an old pair of shoes or tatty last-season skirt from Zara. The same applies if you hate crowds. Small towns are where the original spirit of King’s Day lives on – if you like silly games involving eating cake which has been tied to a piece of string with your hands behind your back, that is. 3. Take a big bag for your purchases and take lots of coins. No one has 50 cents change to give you for that Beatles plate you just bargained down from €10 to €9.50. According to the ING, sellers expect to learn an average of €90… so that says something about the sales techniques. 4. Don’t buy too much – like that huge fire fighter’s coat and the books and the straw bag and the wine glasses and the hat stand and all the other things which seemed like such a good idea at the time. You’ll have to carry them around and then when you get home you will find nothing fits and the book is missing the final pages. However, you will at least have stock to sell next year. 5. If you have children, buy plastic dinosaurs now. Every child goes through the dinosaur phase and then sells them on again a couple of years later. Same goes for ski clothes, Donald Duck comics and cuddly toys. You will never find Lego on sale on King’s Day. 6. Do not buy dvds of television series and films you have always wanted to see because you will never watch them. 7. Do not overdo the orange unless you want to look like a tourist or a frat boy or girl. An orange hair decoration or a t-shirt with a jokey slogan is okay. But an orange wig, feather boa, crown, trousers and Aperol spritzer is just slightly over the top. 8. Do not feel guilty about not giving 50 cents to cute kids with violins who can’t play or not buying lurid cup cakes from kids whose mums can’t bake – even if they have turned into a soggy heap. These kids make a fortune. We know of children who earn hundreds of euros every year getting folk who had drunk just a little bit too much to try to drop a euro into a glass in a bucket of water. 9. Do make sure you have befriended someone who lives in a good vrijmarkt spot, so you can drop by and sit down for a bit to watch the world go by – unless it is pouring with rain of course. 10. Do not feel obliged to have a good time because, yay fantastic, it’s King’s Day! Lots of people hate it. They really do. And you can always stay home and watch it all on the telly.